Greenville junior Emma Klosterman (1) smashes one passed a pair of Springfield Shawnee players on Saturday in a Division II sectional tournament match at Tecumseh High School. Shawnee won the match in four sets. Greenville junior Abbie Yoder (23) gets a kill against Springfield Shawnee on Saturday in a Division II sectional tournament match at Tecumseh High School. Shawnee won the match in four sets. 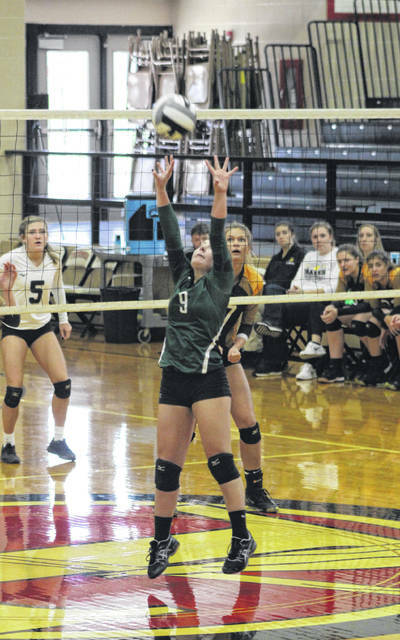 Greenville senior Brooke Stachler (9) sets the ball up for one her teammates against Springfield Shawnee on Saturday in a Division II sectional tournament match at Tecumseh High School. Shawnee won the match in four sets. Greenville senior Chloe Cox (4) serves the ball against Springfield Shawnee on Saturday in a Division II sectional tournament match at Tecumseh High School. Shawnee won the match in four sets. 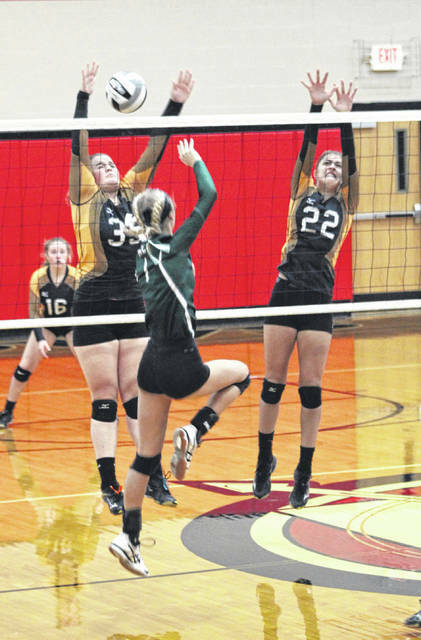 Greenville’s Allison Powell (2) and Abbie Yoder (23) go up for a block against Springfield Shawnee on Saturday in a Division II sectional tournament match at Tecumseh High School. Shawnee won the match in four sets. 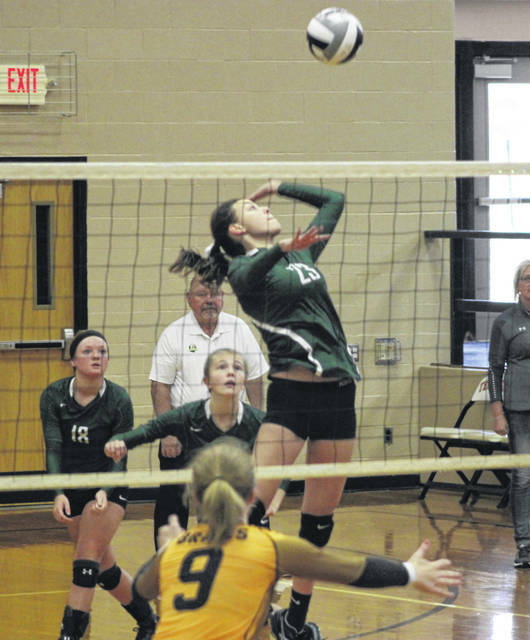 NEW CARLISLE – It wasn’t just about a loss for the Greenville volleyball team on Saturday. Sure, a loss is always disappointing, but after the Lady Wave dropped a closely contested, four-set match to Springfield Shawnee in the Division II sectional volleyball tournament at Tecumseh High School, the first-year coaching team of Michelle and Jim Hardesty had nothing but praise for their squad. “For our first year with them I couldn’t be prouder of how they played,” Jim Hardesty said after Greenville lost 25-14, 14-25, 25-21, 25-23. The Lady Wave fell behind early in the first set getting down 7-2 before a Madilyn Francis kill helped kick start the offense. Greenville battled to within two points on a couple of occasions – 12-10 and 14-12 – before Shawnee ran off for the 25-14 win. Just like Shawnee in the first set, it was GHS that jumped out early and rolled to the victory to tie the match at one win apiece. The Lady Wave rolled out to a 6-1 lead with junior Josi Worden serving. 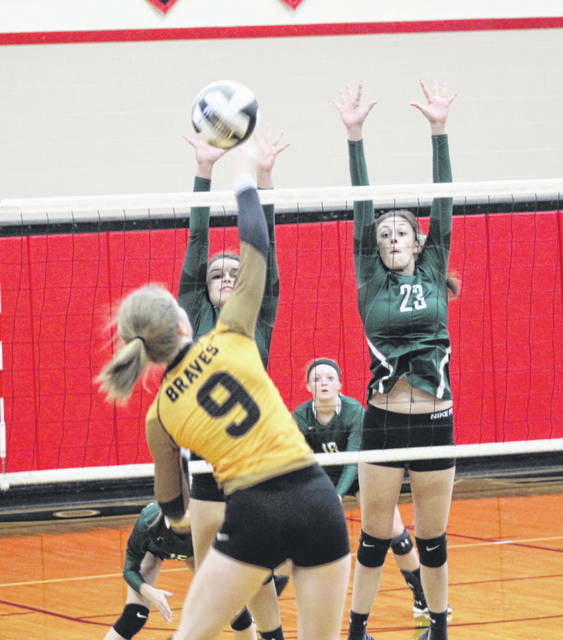 The Braves come back to knot the set at 10-10, but a key block point by Abbie Yoder got the serve back to Greenville which only allowed Shawnee to won four more points in cruising to a 25-14 second-set victory. In the crucial third set that would give the winner a decided advantage, it was nip-and-tuck all the way as Greenville fell behind 21-15 late in the game but closed to within 24-21 before the Braves took the final point for the 2-1 set lead heading to the fourth game. 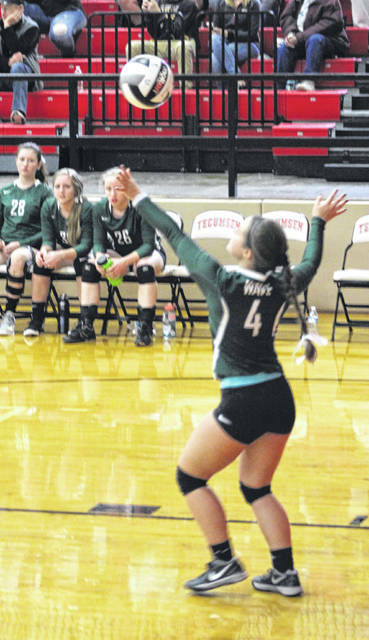 Greenville started strong in the fourth set, but Shawnee rallied for a 6-5 lead early. Then it was the Lady Wave who regained control of the game with a 10-6 lead after a kill by Yoder. Shawnee pulled in front again at 13-12, 14-13, 15-14 and finally 16-15 although the Lady Wave didn’t quit getting to 24-23 before Shawnee took the final match point. Statistically speaking, Greenville was led by Emma Klosterman (14 kills), Francis (12 kills, 1 ace and 1 block), Koryann Elliott (7 kills, 1 block), Yoder (7 kills, 4 blocks), Shelby Hermann (3 aces, 23 digs), Brooke Stachler (28 assists, 1 ace, 9 digs) and Chloe Cox (14 digs). The Lady Wave finished the season 11-12 and will lose five seniors from the team. They are Cox, Hermann, Stachler, Elliott and Mariah Nicholas. “This senior group has done a tremendous job leading and now it is up to the juniors to carry it on,” Jim Hardesty said. “We’re right where we want to be. We would like to have won today of course, but we are still right where want to be. There was a lot of improvement this year so if we make that same improvement next year we will be a pretty good force.